X1 continues to garner widespread acclaim in 2015 for providing enterprise end-users with the fastest, easiest-to-use, cloud-enabled enterprise search software from any device through X1 Search Virtual. The experts in this domain recognize that X1 is providing a game-changing capability in this new era of enterprise virtualization and mobility, while traditional enterprise search tools are simply not built to support the new paradigm. 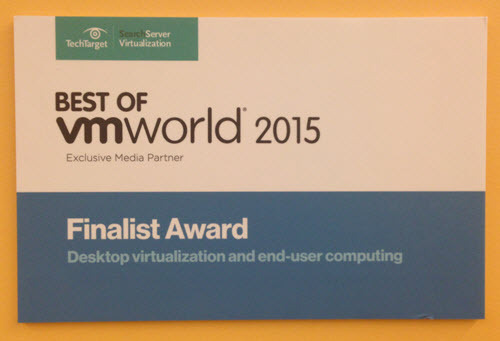 Earlier this month, a panel of judges comprised of recognized experts and editors chosen by TechTarget’sSearchServerVirtualization.com, awarded X1 “Best of VMworld 2015” Awards Finalist in the Desktop Virtualization and End-User Computing Category. The judges evaluated 153 nominated products on display at VMworld 2015, and based the winners on innovation, value, performance, reliability, and ease of use. X1 SearchTM Mobile brings X1’s award-winning user interface for desktop search to the mobile device, providing lightning-fast and secure search of email and files while on the go. This means users will no longer settle for the limited, slow and inconsistent “Exchange-only” searches of current smartphones. X1 Search Mobile enables full email (including archived emails) and desktop search from the mobile device, keeping workers productive no matter where they are. Notably, X1 was the only software provider at VMworld 2015 offering enterprise search for virtual environments with real time access from any device. High level discussions with Gartner and other key industry experts and executives confirm that X1 is far ahead of the pack in delivering this unique and disruptive capability. This capability is made possible by X1’s virtual “always-on” index enabling access to your files from any device, which is the main use case for Box, Dropbox, and other EFSS tools. But with X1, you also access your emails from the same interface, with built in X1 search and an overall better user experience. And best of, this can all be accomplished through an enterprise’s existing on-premise virtual or private cloud infrastructure. The 2015 recognition began in April, when Gartner named X1 a Cool Vendor in EndPoint Computing. According to Gartner’s report, “X1 can improve end-user experience on hosted virtual desktops by maintaining Windows and Outlook searches, which are often lost in the transition away from traditional PCs.” Platforms like VDI and DaaS hold great promise, but the user experience with VDI is often sub-optimal, thereby hindering widespread adoption. X1’s recognition by Gartner as a Cool Vendor validates our innovation in cloud and virtual environments, as well as our commitment to provide a stellar end-user experience. If you can take advantage of X1 Search’s ability to extend its reach to SharePoint or cloud-based email and Box, or make use of its ability to build much more sophisticated search phrases than Lookeen can handle, X1 Search is the obvious choice. To get three major awards in one year is obviously gratifying and validates that the approach to support enterprise virtualization and mobility through a stellar search experience is a winning strategy to support our customers as they rapidly embrace the next generation desktop. We look forward to continuing to deliver an unmatched search experience across data anywhere, on any device. X1 is exhibiting at VMworld this week and it is impossible to avoid the theme of mobility. There is a whole track at the conference devoted to “the mobile enterprise.” Given that the workforce is mobile more than ever and using multiple devices in any location, workers need access to applications and information on-the-go. It is not surprising, therefore, that folks coming by the X1 booth are intrigued by X1 SearchTM Mobile. IDC estimates that, by 2020, mobile workers will make up 72.3% of the workforce – the need for mobile productivity is and will be very real. X1 SearchTM Mobile enables an instantaneous and secure search of millions of documents and years of email from a smartphone, a game-changing capability for today’s mobile workforce. It brings X1’s award-winning user interface to the mobile device, providing lightning-fast and precise search of email and files while on the go. No longer will users need to settle for the limited, slow and inconsistent “Exchange-only” searches of current smartphones. X1 Search Mobile enables full email (including archived emails and PSTs) and desktop search from the mobile device, keeping workers productive no matter where they are. In today’s “always on” environment, X1 Search Mobile allows users to quickly and effortlessly find and take action on the information they are looking for regardless of where it is and when they might be looking for it. Imagine being at the airport, with your laptop packed away and a client calls with questions on a proposal you sent. You don’t have time to pull out your laptop, fire it up, and pull up the proposal. With X1 Search Mobile, though, you can quickly find that proposal right your phone, pull it up within seconds, and answer the important questions your client has. The first question that many have when it comes to mobile information access is, “what about security? Will this be an access control nightmare?” With X1 Search Mobile, the answer is easy – this is a search application built for the enterprise. It integrates with leading Enterprise Mobile Management (EMM) tools such as AirWatch and Good Technologies so that security is built in from the ground up. In fact, by using the EMM security layer, X1 Search Mobile can help organizations enforce BYOD policies. For example, if an organization wants users to only do corporate email in the email app of the EMM provider, X1 Search Mobile can enable a post-search action that launches the EMM email app versus the native email client of the phone. With X1 Search Mobile, true mobile productivity is possible. Workers can have search precision light-years beyond what current smartphones offer natively, with a single-pane-of-glass view across email, desktop files, SharePoint and other enterprise content on the mobile device. Within this user interface, workers will experience fast-as-you-type search, full-fidelity preview of attachments with hit highlighting and infinite scrolling of search results (no need to “continue search on server”). This approach to mobile search is ground-breaking and fills a huge productivity void in today’s mobile enterprise. X1 Search Mobile provides an intuitive user interface to email that goes well beyond the native search of the mobile device while also providing access to desktop files, SharePoint, and other critical sources of content. X1 enables true mobile productivity. While other search vendors offer a vague mobile SDK so that consulting companies can build search apps, X1 offers the real thing – a mobile search application that gives users access to their critical information and enables mobile productivity. Learn more and see the product in action here.